Here at Bike Florence & Tuscany, we have some exciting news – e-bikes have arrived! So what are e-bikes, exactly – and how can they help you experience the magic of Tuscany? 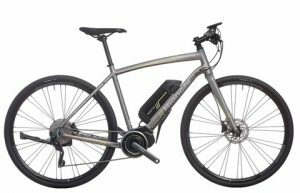 The premise of e-bikes is simple: take an ordinary bike, add an integrated electric motor, a battery and hey presto! You’ve got yourself a bike, and a booster, all in one! But what is it actually like to ride an e-bike, and are they right for you? 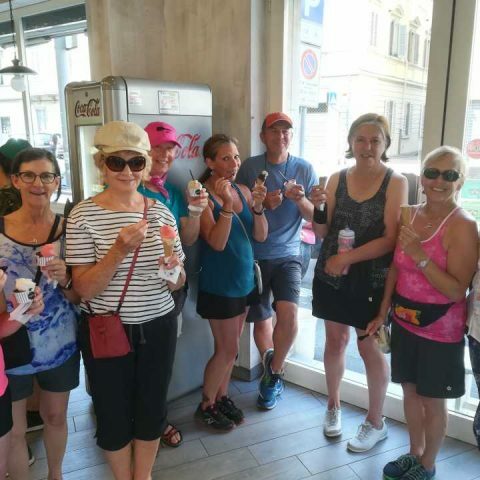 Rosalinde Tullio, guest on our Tuscany bike tours for two years in a row, made the e-bike experience in Rome, during her long travels through Europe the past year. And she wants to share with you the meaning of “assisted pedalling” e-bike touring seen from the best point of view, the unbiased opinion of a biking tourist with no particular cycling training. Read on, enjoy and visualize your dream come true! As a ‘resolutely recreational rider’, I am the first to jump on a bike when on holidays, and to seek out the thrill of a cycling tour. Like so many of us, however, my lack of cycling when in my ‘real life’ somewhat tempers my enthusiasm to jump headfirst into those longer (or steeper!) bike tours more suited to full-time lovers of lycra. 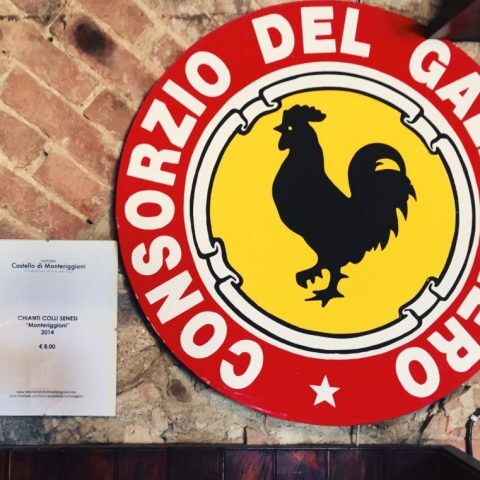 Thus it was, on a recent holiday to Rome, that I found myself caught between my unbridled eagerness to ‘take on’ a tour, and my flailing fitness! Enter…the e-bike. My first experience on an e-bike was a lot of fun! The perfect solution to my dilemma, renting an e-bike meant that I could happily sign up for the tour of my choice without worries of holding up my tour mates or being left behind* (side note – e-bike or no e-bike, Elena and Piero will never leave you behind!!) . Virtually a ‘normal’ bike, e-bikes still require you to pedal, keep your balance, use the brakes and feel comfortable on a bike. The main differences are the weight (the attached battery means that e-bikes are far heavier than regular bikes) and the capacity to give yourself a boost if you need a little help up that really big hill! In fact, I found that for many flat sections of my tour, I turned the power off entirely and used it as a regular bike, then gladly activated the battery for the hillier sections. 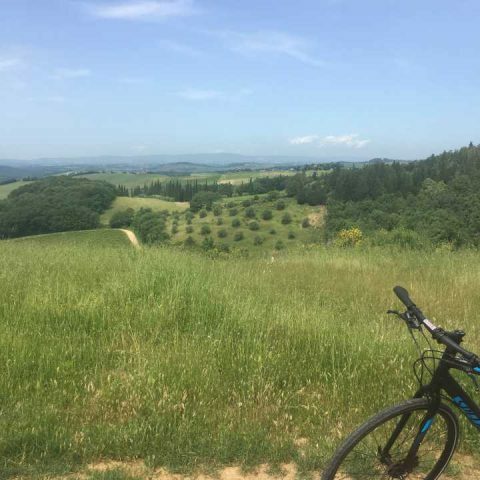 So – if you are perusing this wonderful website and thinking that the magic of biking in Tuscany is not for you, think again! So long as you feel comfortable with the basics of bike riding, using one of our brand new e-bikes will ensure that you not only conquer the tour of your choice, but that you truly enjoy the journey…and that is what it’s about, after all! Our passion for both cycling and Tuscany has allowed us to create itineraries that are only on non-touristy roads.